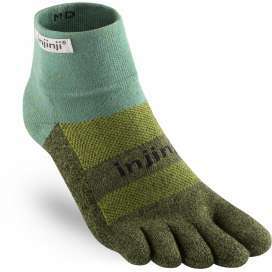 The INJINJI toe socks allow the toes to move naturally and are correctly aligned, which offers greater stability and more comfort. They are formed by fibers of proven quality that are durable, lightweight and flexible to offer maximum breathability, which translates into fresh, dry and comfortable feet. 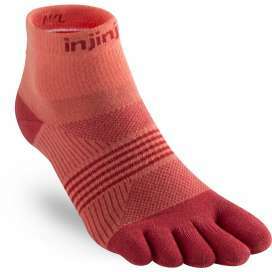 Many people wonder why toe socks are better than the traditional sock design. The answer is surprisingly simple. We created a sock anatomically designed to your foot, and the five-toe sleeve design allows your toes to splay naturally and align properly, enabling greater stability and more comfort. We only use superior fibers that are durable, light, and flexible to offer superior breathability, which means cool, dry, and comfortable feet. We intended to create a sock that fits naturally, protects from blisters and is so comfortable you forget you’re wearing socks. That’s the way it should be. It’s no wonder many footwear brands are designing shoes with wider toeboxes to accommodate the need to run and perform natural and free. Make sure you pair your footwear with one of our toe sock products to create the best possible layer between foot and shoe. Feel the difference™. 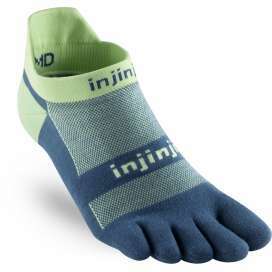 Lightweight Injinji’s thinnest sock provides ultra thin cushioning allowing extra breathability and a light feel in any shoe. All Lightweight socks are made with a 200 needle count (Except Women’s Run Lightweight). Original Weight With the thickness of a traditional sock, Original Weight provides a moderate cushion ideal for a wide range of activities. 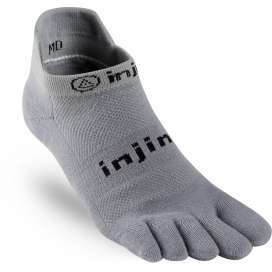 Midweight Injinji’s thickest sock provides heavy cushioning throughout the sock. 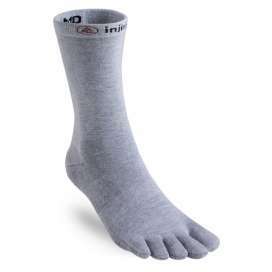 Designed for maximum protection, the Midweight sock features a padded heel and metatarsal for durability and protection. 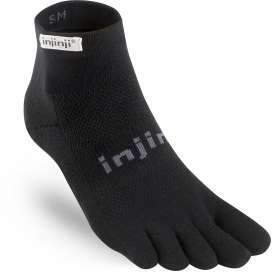 Injinji’s thinnest sock provides ultra thin cushioning allowing extra breathability and a light feel in any shoe. Designed with AIS ™ technology, made with an internal layer of CoolMax® and a resistant outer layer of Lycra, delay the appearance of blisters and scrapes. Recommended for all types of slippers, especially for the minimalist Vibram Five Fingers. The Trail series is engineered for the uneven and unpredictable terrain of the trail to offer the best fit, feel and protection in any shoe. Trail socks are built to handle the impact of dirt paths and rocky trails with a protective cushion and midweight design. The crew length rests at mid-calf. 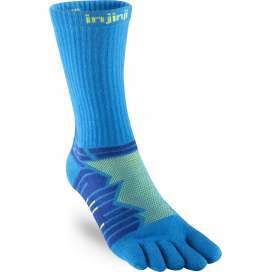 Injinji Trail Midweight socks incorporate all the benefits of CoolMax® fiber with extra protection in midfoot and heel area. 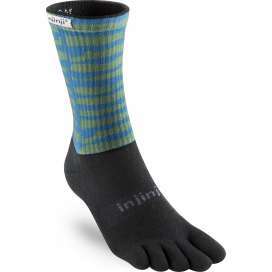 The unique toes Midweight Sock design allows for natural movement of foot, while eliminating skin-to-skin friction to prevent blisters.